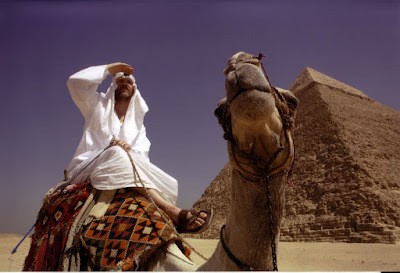 Google+ Cinema Viewfinder: DVD Review: Where in the World is Osama bin Laden? - Documentary or "Reality TV" Brought to the Big Screen? DVD Review: Where in the World is Osama bin Laden? - Documentary or "Reality TV" Brought to the Big Screen? Filmmaker Morgan Spurlock is back. His last documentary, Super Size Me, was a charming exploration of the effects of McDonald's fast food on someone if eaten 3 times daily for a month. He's similarly gone on to explore other issues on his FX network show, 30 Days, where he subjects himself to a certain lifestyle - like living in jail or living with a homosexual - for a month. In his newest film, Where in the World is Osama bin Laden?, he ostensibly goes on a search for Bin Laden and ends up getting an education in Islam, instead. With his wife pregnant, Spurlock claims his thoughts turned to the kind of world they were bringing their baby into. It being a post-9/11 world, he soon hones in on why Bin Laden has managed to escape justice for so long. This spurs him to go on an international manhunt for him, visiting countries like Egypt, Saudi Arabia, and Afghanistan. The documentary explores the reality of living under Islamist rule, and the role America has played in Mid-East politics. It also tries to dispel some of the myths that are perpetuated regarding Muslims. The problem with the film lies in Spurlock's approach. While the focus on him worked in his first documentary, which was about the relatively small-scale problem of fast food and obesity, this angle does not work as well here. Often times playing the themes for laughs, Spurlock is shown conducting basic defense training for his trip, visiting unfriendly local middle eastern neighborhoods as he tries to fit in (by growing his reddish beard out... but still wearing good old American denim jeans), and gently prodding women at the mall to take off their burkas. This teasing is charming when the object is a corporate giant like McDonald's. But in this film it comes off as a little elitist. Spurlock also starts to betray a quality of self-aggrandizement. He centers the film on the locals' various reactions to him at the expense of the answer to his question. In Israel, he practically provokes a fight with the local Hasidim, after being told to leave their neighborhood, in order to spice up the proceedings. In his attempts to blend in, it's as if he is doing so with a large neon sign over him that says, "Hey, isn't it neat how well I'm blending in?" Even his interactions with his wife betray a certain self-centeredness. Leaving your wife during a pregnancy for a trip to a hostile area of the world is not exactly the most sensitive thing to do. It is unfortunately becoming a subgenre of the documentary, perhaps inspired by "reality" TV, where the documentarian becomes part of the proceedings. In a film exploring issues of current importance to our society, it is sad that the object of examination gets lost in such antics. Where in the World is Osama bin Laden? will be available on DVD this upcoming Tuesday, August 26th. Labels: 30 Days, documentary, DVD Review, Islam, Morgan Spurlock, Muslims, Osama Bin Laden, Super Size Me, Where in the World is Osama bin Laden? I heard Spurlock on the radio promoting this film, and it sounded pretty unappealing. Like Michael Moore lite, and I've got problems with him too. What did you think of Fahrenheit 9/11? I actually don't have a problem with Michael Moore. He is blatantly biased, and he is a bit of a showboat. But he seems to own up to that fact, so I think it's OK.
What bothers me about Spurlock is his pretending to do his thing out of selflessness. In the case of this film, it's supposedly because of his concern for his child's future... yet he abandons his wife to go through the pregnancy alone. As a man with a currently pregnant wife I can tell you... so not cool! Same thing in "Super Size Me", he goes through this "diet" to make a point about obesity. But it felt disingenuous somehow. It's a fine line. But for me, Moore is on the right side of it, and Spurlock is not.